Continuing the Halloween love, today's spotlight illustrates you can keep a modern aesthetic and still decorate for the holiday. 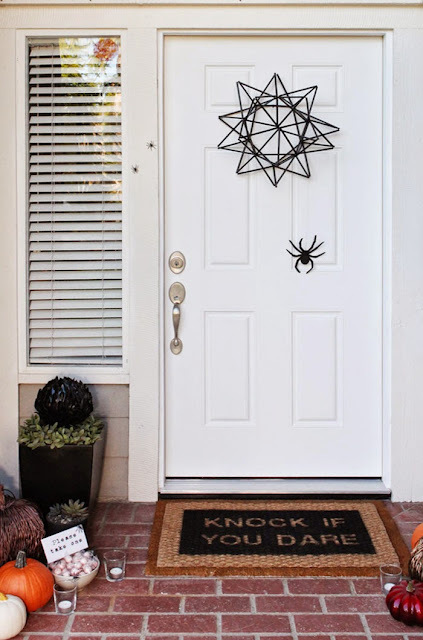 Katja of ShiftCtrArt shared her take on an unexpected Halloween wreath and other simple projects for her entryway. Can you believe she made that fabulous geometric structure with just straws and floral wire! For the complete how-to make your own as well as details on the other projects seen here, visit ShiftCtrArt. Want more Halloween inspiration? Check out some of my favorite Halloween Love features from years past below or browse my own Halloween parties in the entertaining gallery. Katja has the best ideas! I love her wreath and that doormat! Love Katja! She is super talented and one of the sweetest people I know!